President Duterte arrived in Tokyo, Japan for a three-day visit (October 25-27, 2016) as he was warmly welcomed by the Japanese officials. In his second day of visit, the President of the Philippines spoke before the participants of the Philippine Economic Forum in Prince Park Tower Hotel. Since Japan and Philippines is celebrating their 60th year of a good bilateral relations, his speech focused on improving close ties with Japan by increasing investments on the country relating to agriculture and praising Japan for their efforts in being the "second top source of official development assistance". 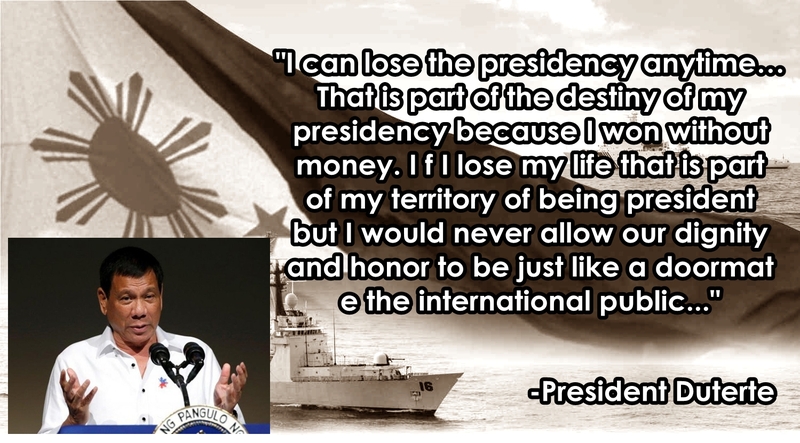 Moreover, the President shared about the dignity and honor of Filipinos, telling that Filipinos can survive amidst the war against drugs. Based from the President Duterte's speech, Japan is the first and only bilateral free trade partner of the Philippines. The president is certain that support from Japan will provide great impact on the Filipinos. Aside from official development assistance, the government of the Philippines is determined to generate more jobs for Filipinos to end the rate of unemployment. More jobs will make it easier and more attractive to do business in the country. "By cultivating an environment conducive for business, we are confident that more Japanese businesses will follow and go to the Philippines...", President Duterte said. 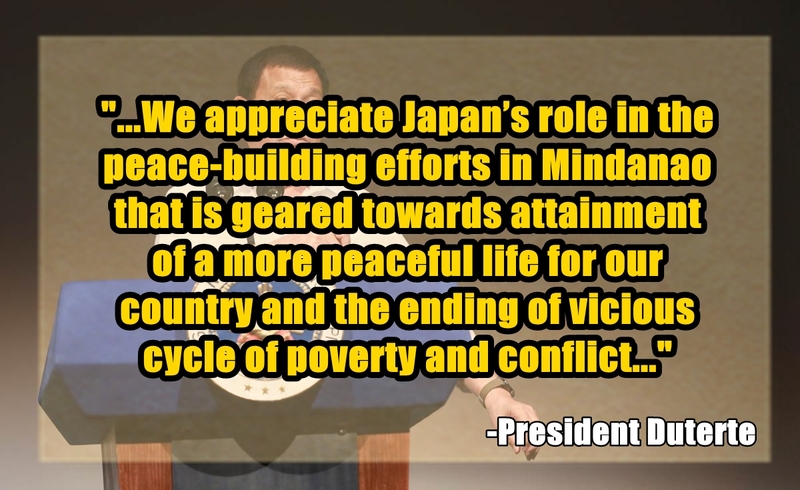 The President of the Philippines praised Japan for the efforts in ensuring peace and order in our country which is also crucial for economic development. He also added few statements in his address relating to his visit to China. He assured that all they talked about was purely "economics". He explained, "We do no talk about arms, about stationing of groups... We avoid talking about alliances, military otherwise. What happened there was just few platforms where investments could come in." Right after his statements regarding his visit in China, he made it clear to the crowd that it is his time to stand as a dignity of the Filipino. He revealed that there is a serious problem of drugs in the Philippines that made him declared war against drugs. 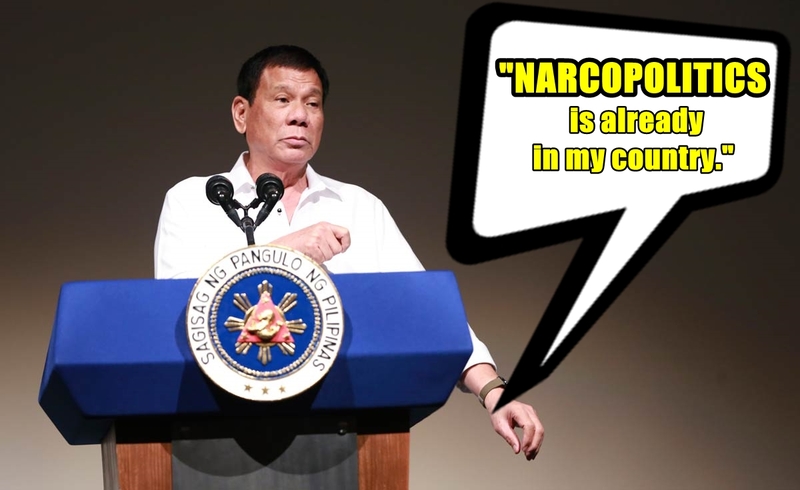 Also, he once again lashed out at the "supposedly friends of Philippines", US (United States) and EU (European Union) for their criticisms against anti-drug war. President Duterte declared that his administration will pursue an independent foreign policy. This means that the said government "will adopt and implement policies that would safeguard its national interests and to achieve goals within its international relations environment." The president firmly stated that he want "friendship" with everybody and not to be "drawn into vortex of violence in countries like Pakistan, Iran, India, France, Britain, Russia, America, and China." In addition, Duterte said could accept such treatment and criticism as Davao City mayor, but not as President when he already carries the burden of sovereignty. President Duterte firmly believes that Filipino can survive amidst all the issues arising after the declaration of war against drugs. He said that even the Philippines is poor, it should still be respected for there is such a thing as "dignity" of the Filipino people.